Edmund Spenser wrote The Faerie Queene in the 16th century during the reign of Queen Elizabeth I. The longest poem in the English language, The Faerie Queene consists of six books, each detailing the adventure of a knight who represents a virtue, including King Arthur. Queen Elizabeth I is personified through multiple virtuous characters (including the Faerie Queene) who represent aspects of her character, while those opposing her reign, such as the Catholic Church, the Pope, and Mary Queen of Scots are represented by the villainous characters. Spenser sought to connect Tudor England and the mythological world of King Arthur, lauding Protestant virtues by displaying them through a romantic, idealized lens. The Pre-Raphaelites and followers of the Arts and Crafts movement also looked to the Middle Ages in a romanticized way, holding the “honest and sincere” methods of the craftsmen in high esteem as they protested the Industrial Revolution. Crane’s illustrations for The Faerie Queene were the most ambitious of his career. Overall, they took him three years to complete, and in the end he had finished 88 large illustrations and 135 illustrative head and tailpieces. 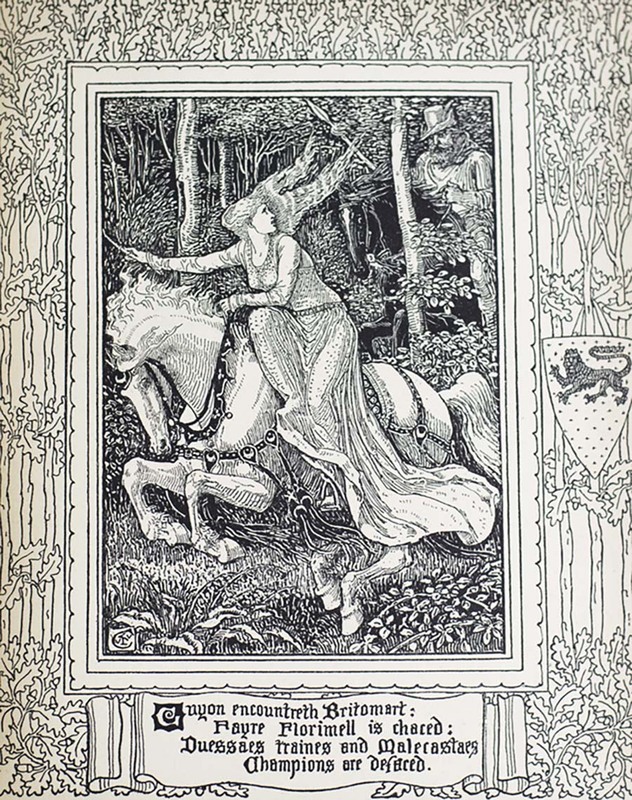 The Faerie Queene was an appropriate poem to be illustrated by Crane, who preferred engraving in thick black lines and working in woodblock prints as Medieval craftsmen, such as Albrecht Durer, would have done.